Just like any other business, restaurants need to reach out to previous clients as well as potential customers to keep the business going. If you’re a restaurant owner, you would want your customers to come back for more delectable dishes, and for curious clients to try your appetizing menu and become loyal patrons. 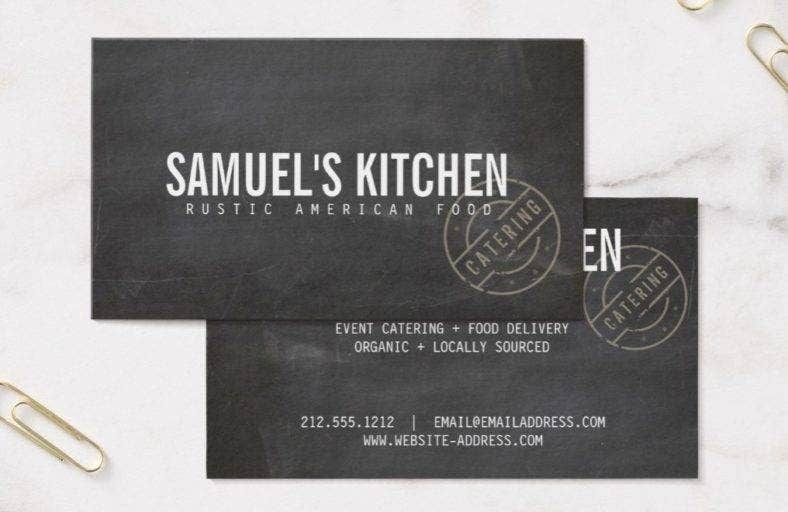 If you think you already nailed the food, the ambiance, and the clientele, then all you need is the perfect business card designs to take your restaurant business to greater heights. 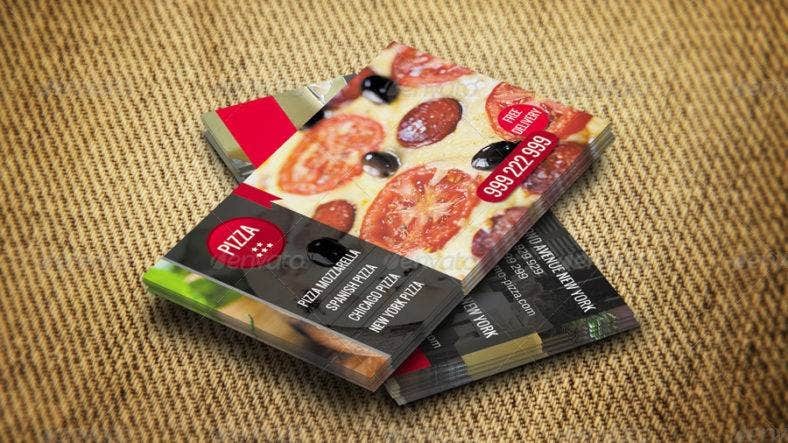 With your cool business cards in your customers’ wallets, it is easier for them to decide and reach out to you whenever they are hungry or when they are throwing a feast. It also helps a lot in recommendations as a premium business card states that you are serious and you know what you are doing, so it is easier to convince non-customers to become customers. Furthermore, you will be able to establish a stronger rapport with your clients and score more opportunities ahead. 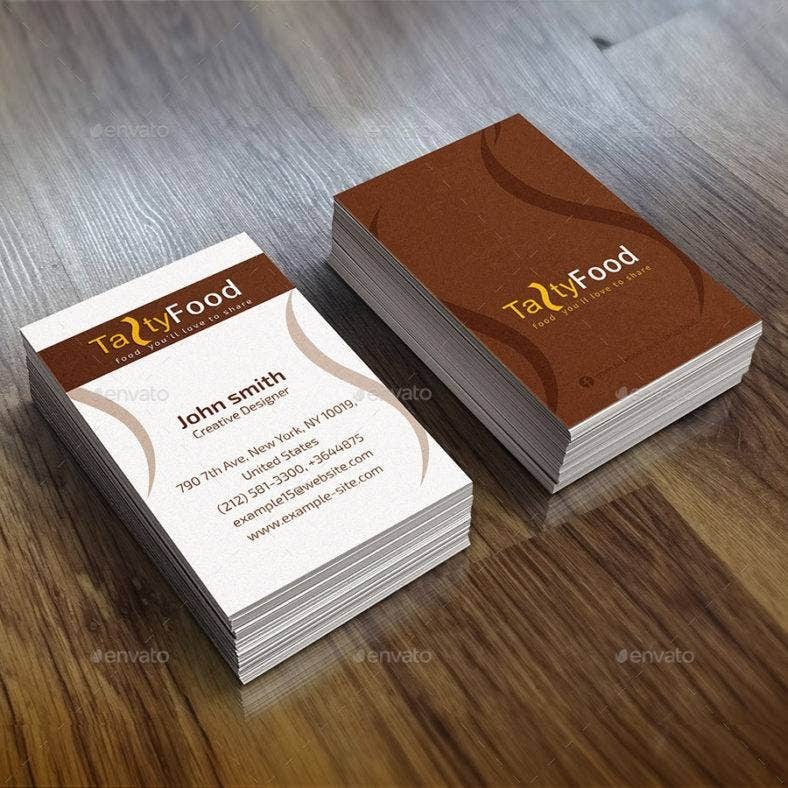 So, here is a collection of creative and artistic business card templates for your restaurants, cafes, bars, and other food-related businesses. Even with the recent advancements in technology, using unique business cards to promote your business is still very important. It is not all the time that people can be online to search for a good place to eat. But it is easier for them to make a choice if they have an accessible business card in their pockets. 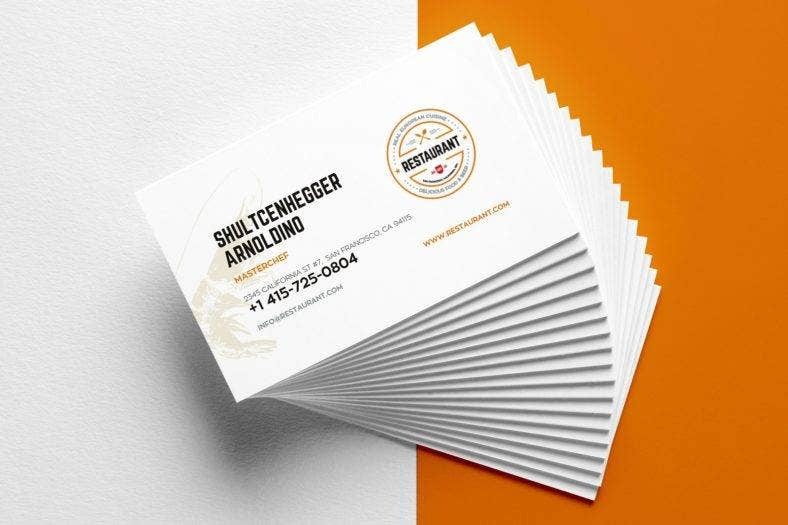 Starting with a clean and minimal restaurant business card, this template comes with seven sets of cards with different layouts for your restaurant. 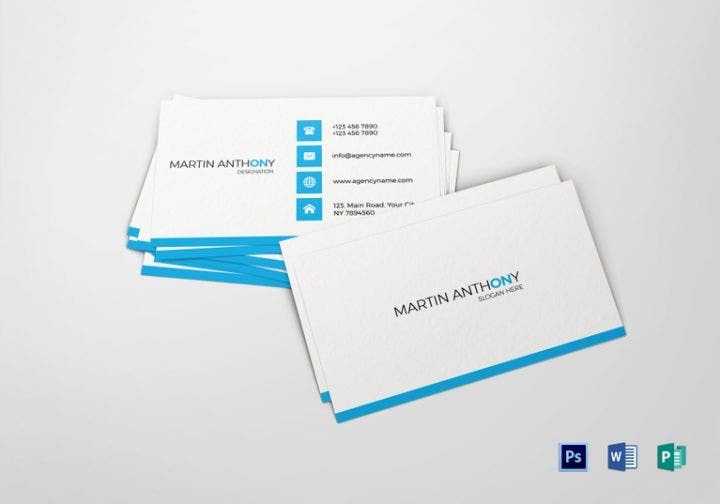 The ample amount of white space allows details to pop out and make this business card look sophisticated and professional. Both of its EPS and AI versions are easy to customize and insert your own information. 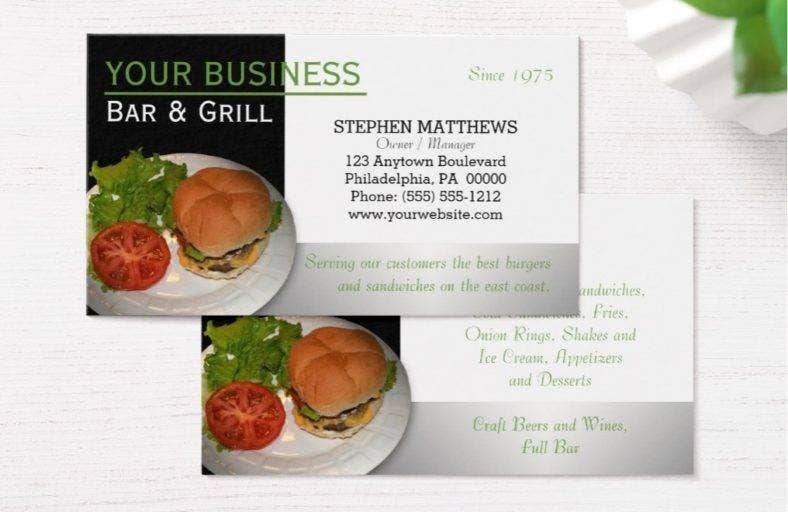 Fast food chains and burger joints need a bold and special luxury business card design just like the template you see above. 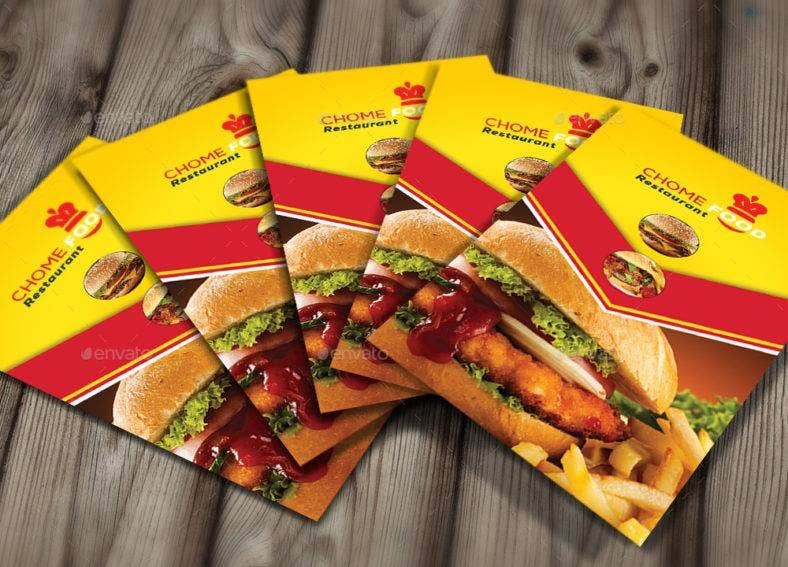 What makes this template special is its vertical layout and unique design, along with the red and yellow color choices which truly represent the type of food your restaurant is offering. It comes with two PSD files which are fully layered and editable. Chalkboard designs are quite trendy nowadays, so here is a chalkboard business card template for a modern and stylish feel. It has a vintage and rustic design which is perfect for many specialized restaurants and themed cafes. You can easily personalize this template just by adding your own details and choosing your preferred size, paper type, and corner style. 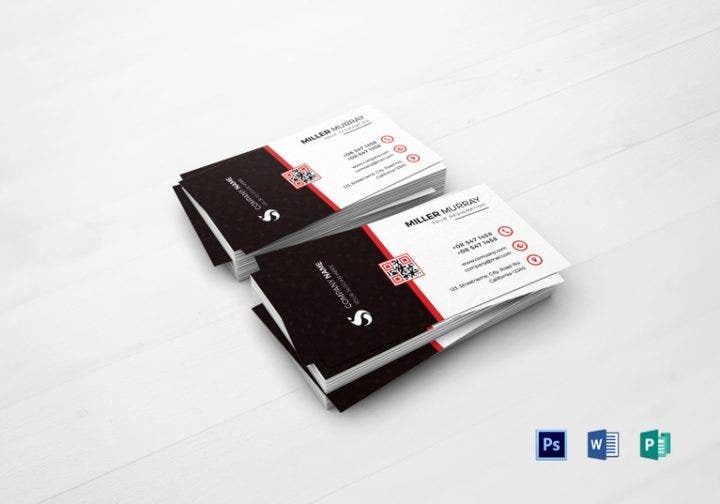 Here is a modern and exciting printable business card template designed for coffee shops, cafes, bakeries, bars, and the like. It boasts of a simple yet artistic layout represented by the hand-drawn doodle bakery set at the back of the card. The template also comes in standard 300 dpi resolution, CMYK color mode, and custom size 3.5 by 2.0 inches. 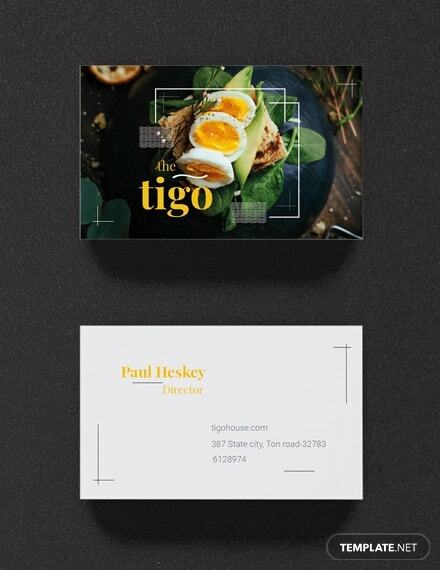 Another modern restaurant business card design, this template is characterized by a full-color back layout and a unique vertical front design. When you download this template, you will get a fully layered and print-ready PSD file in 300dpi resolution and CMYK color format. It is also easily customizable and editable. The size is standard 3.5 x 2 inches with bleed settings. 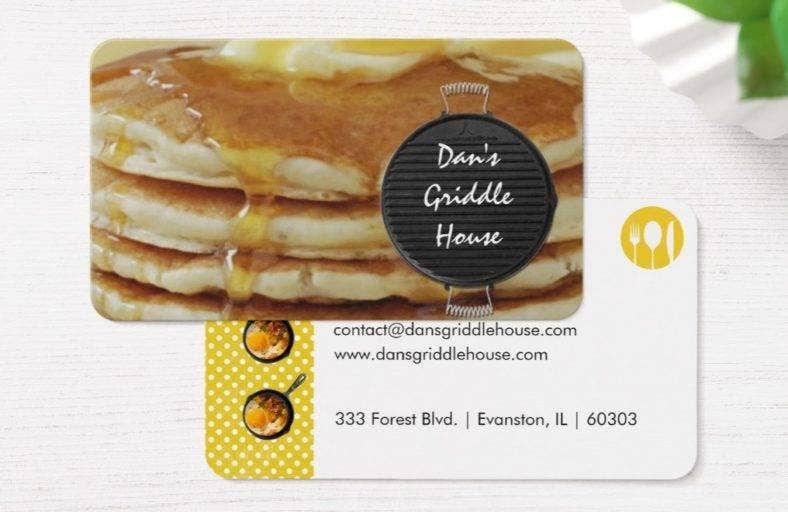 A stunning breakfast restaurant business card template, this item comes with a delectable pancake background image and fancy graphic designs which perfectly match the goodies and treats you are offering. It is clean and professional, but fun and creative at the same time. You can modify this template easily, so it can be used for other related businesses. 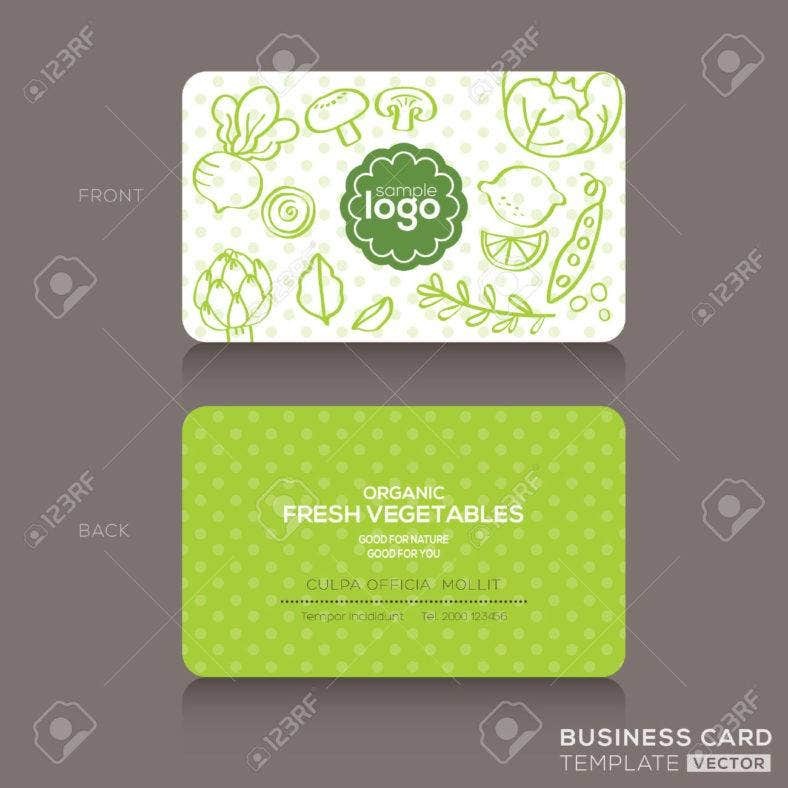 A fresh-looking business card design, this template is especially created for vegan cafes and organic food restaurants as evidenced by the vegetables and fruits doodles on the background. It has an overall beautiful design with vibrant images which you can customize easily, so it matches your brand image and suits your taste. It also allows you to integrate your own creative logo. 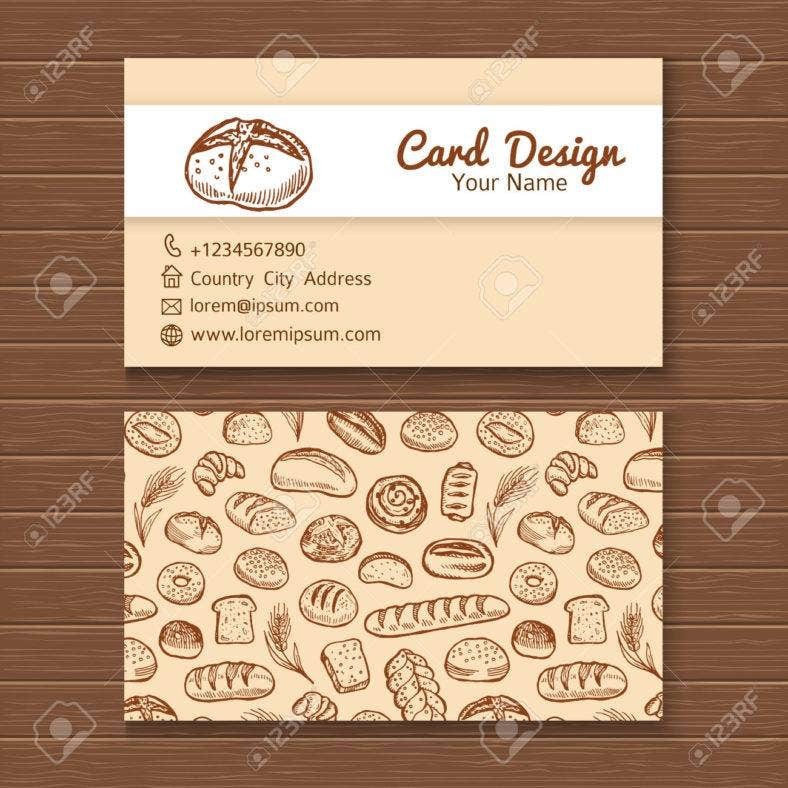 Speaking of unique, here is a modern business card template for all your food-related business needs. It features a full-page layout at the back where you can incorporate gorgeous images related to your business while the front page features a simple and minimal layout with all your necessary details. It is constructed with well-organized layers for faster editing. 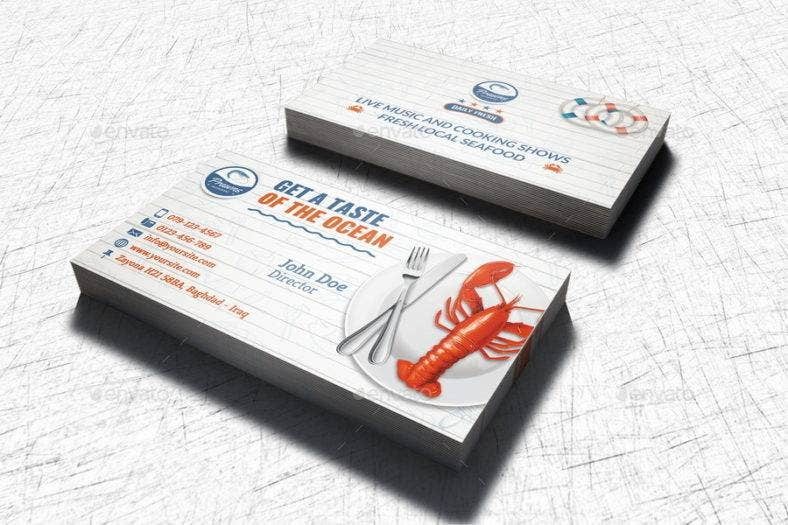 This seafood restaurant business card template is designed to fit various companies and corporate businesses so it looks highly professional and state-of-the-art. Its clean design allows other elements to pop out which makes it eye-catching and tasteful. With fully layered PSD files included in the package, this template is easily usable and customizable. 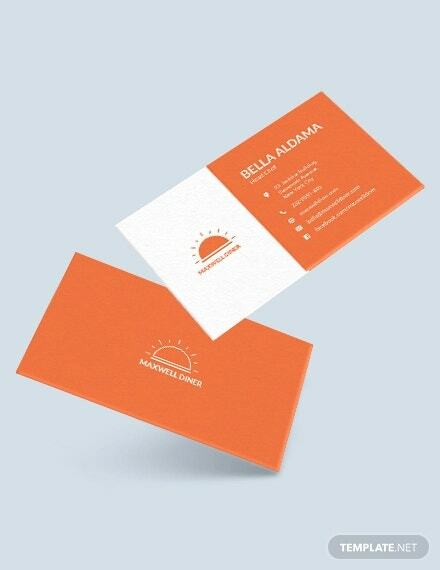 Here is a perfect blank business card template for your tropical restaurants, Caribbean-inspired cafes, or beach-side bars. It is designed with a full-screen image of parrots in the wild which gives it a tropical feel. 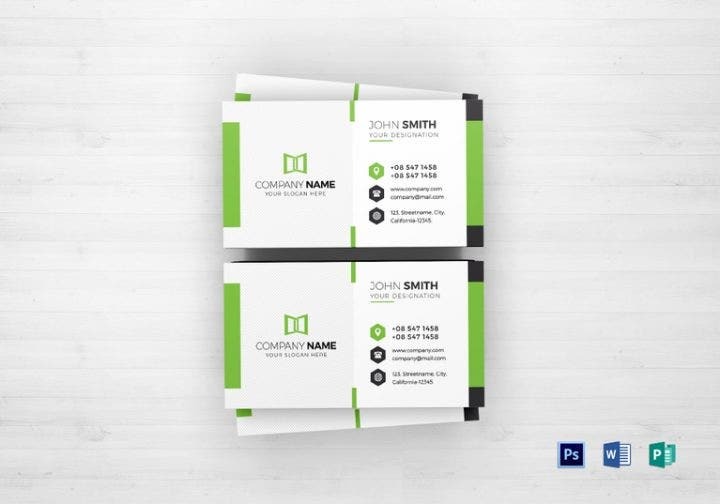 Make a lasting impression with this colorful business card that comes in a full-color CMYK mode, double-sided layout, and a hundred percent satisfaction guarantee. 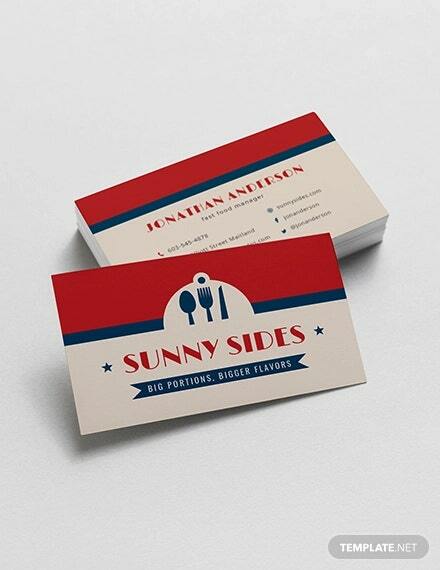 Then, we have this wooden business card design that perfectly suits BBQ restaurants, bars, and grills. This template includes landscape and portrait variations to choose from, along with a free western-style logo design and other design elements. It is designed in Adobe Photoshop with well-structured layers that let you modify the text, fonts, colors, layouts, and more easily. 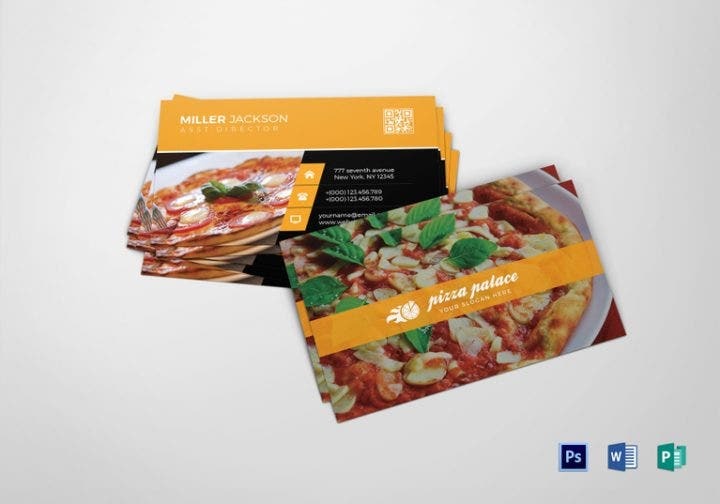 Next is an image-based pizza restaurant business card template that comes in seven color variations. It allows you to change the template’s color scheme with a single click so it matches your restaurant’s brand image. Fully editable and customizable, it also comes with square or round corners and a CMYK 300 dpi setting in a print-ready format. 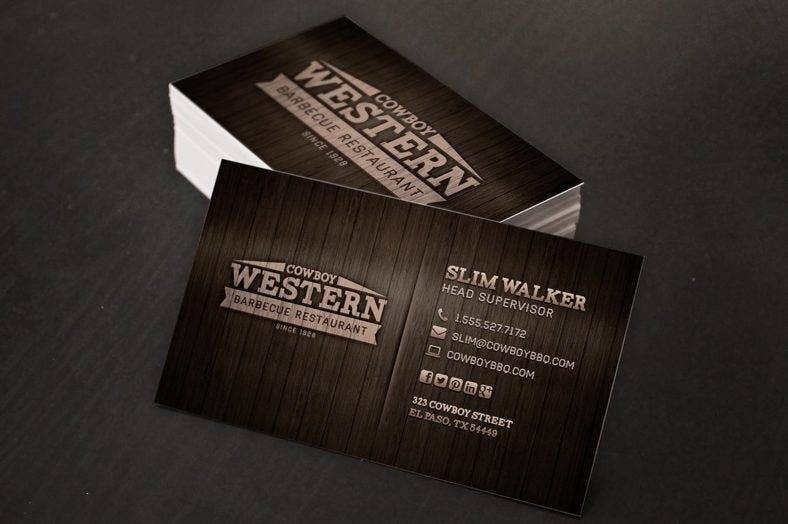 If you are looking for a clean and professional business card design for burger restaurants or grill bars, then this custom business card template is what you are looking for. It comes with a plated hamburger image which provides your customers a perfect glimpse of what they can get from your place. Aside from the standard details, you can also put your menu at the back. 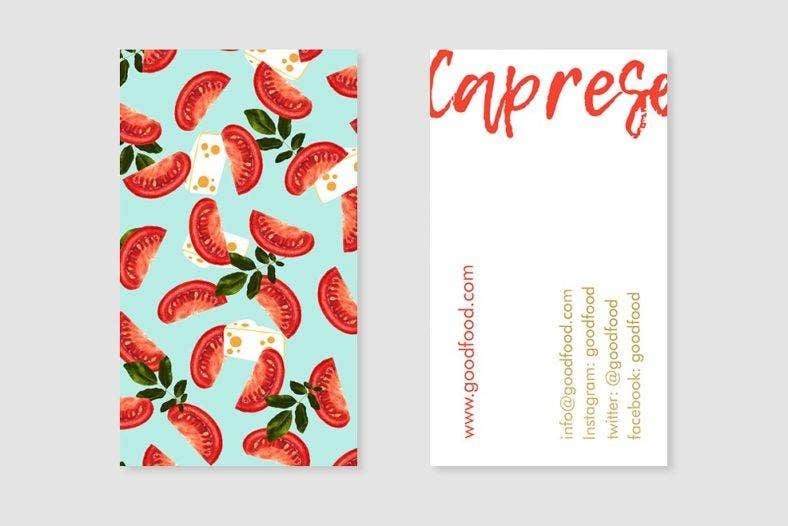 For vegan and organic food restaurants, here is the perfect business card template just for you. 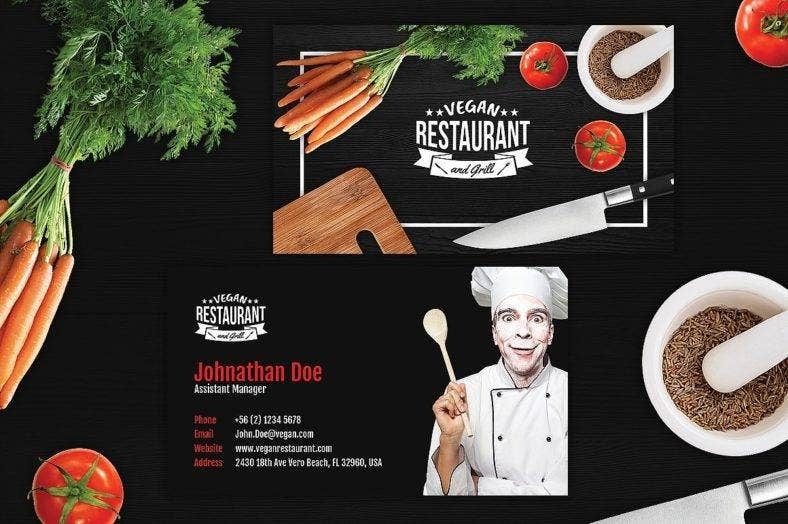 With a dark background that highlight the fruit and vegetable design elements, this business card design template perfectly represents your business. It comes in two layout versions with fully editable PSD files and free fonts. It is print-ready and very easy to use. 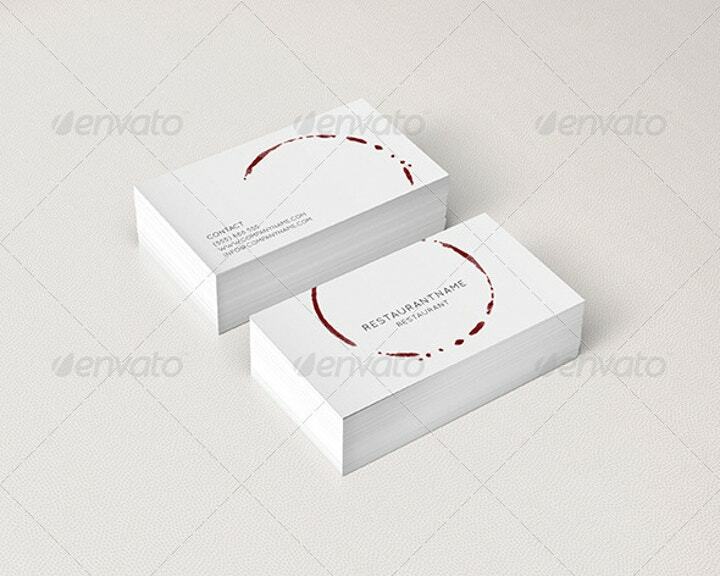 Here is an ultra-modern and minimalist business card template especially designed for restaurants, liquor stores, and sommeliers. It is characterized by an all-white color layout with a wine smudge motif for an attractive visual appeal. It is designed with a print-ready and layered PSD file and comes in 300 dpi CMYK standards and a 3.5 by 2-inch size with bleeds. 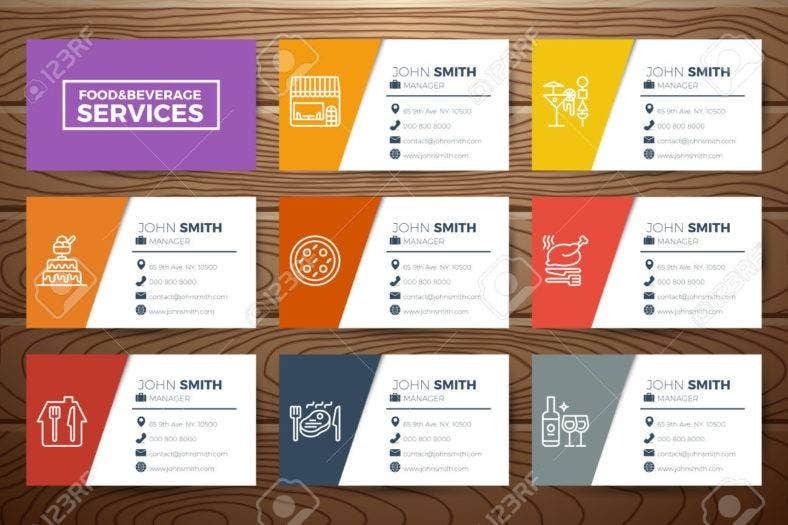 Ending this list is this set of elegant business cards designed for any food and beverage services such as restaurants, cafes, bars, bistros, and so much more. It is characterized by a clean layout, various color schemes, and stunning line icons which represent related business niches. It also features a wooden background for a more raw appeal. 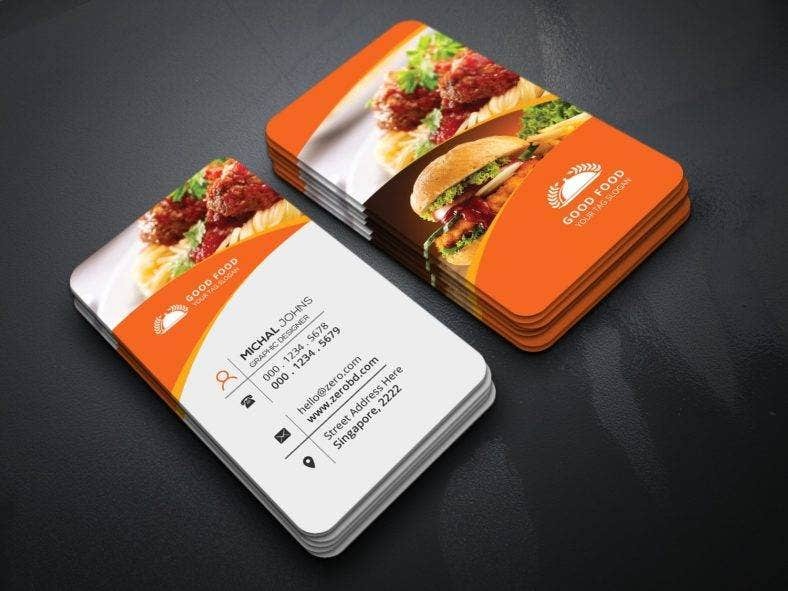 Next is a unique business card template for your restaurant. What makes it different from the others is its vertical layout which includes four color variations. It has a professional and clean structured file that is quick and easy to customize in Photoshop. The template comes in a 3.5 by 2-inch size with bleed settings, 300 dpi resolution, and CMYK color mode. 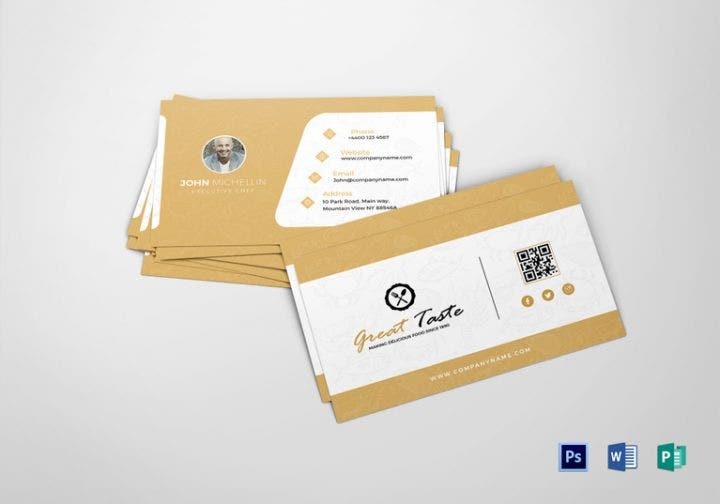 As you may have already noticed, all the business card templates on this list have high customizability to make sure they cater to all your business and aesthetic needs. 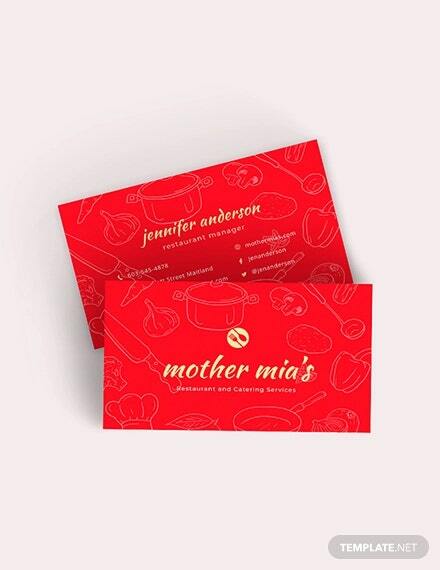 However, there are some things you need to consider when modifying or creating your own business card. Choose an appropriate template. There are zillions of templates available on the Internet, and it is very easy to get lost in the selection process. Make sure to browse carefully and select a design that fits your business. Add your own image. Whether it is a background image or a logo template, it is best to incorporate personal elements in your design as they help establish your brand’s image. Most of these templates give you ideas or allow you to use universal icons. Ensure correct details. 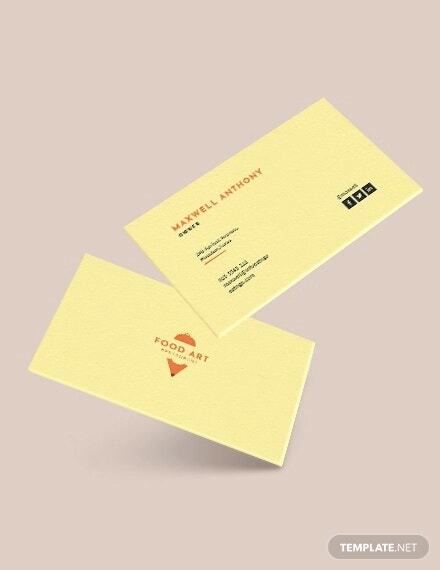 Make sure to include essential details on your business cards so they can serve you in the best ways possible. If you have to add more information, make sure they do not overcrowd your design. 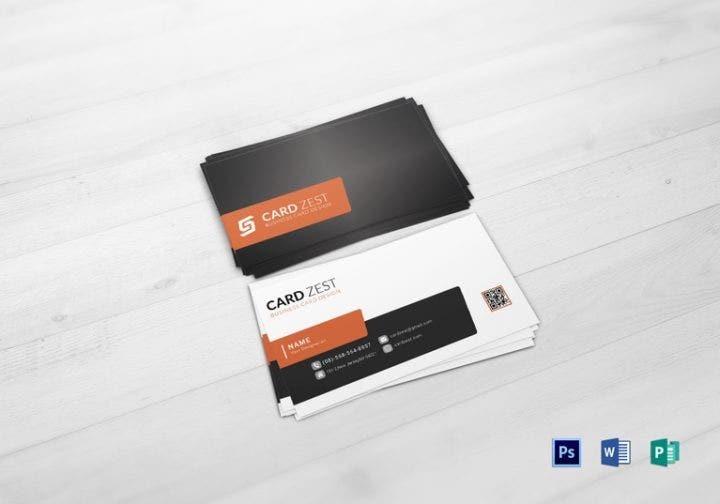 You also have to bear in mind that folded business cards nowadays are not only used to provide basic information but are also used to represent your brand. That is why you have to choose the perfect template that is creative and professional at the same time. For more ideas, you can also check out our collection of the best business card templates of 2017.